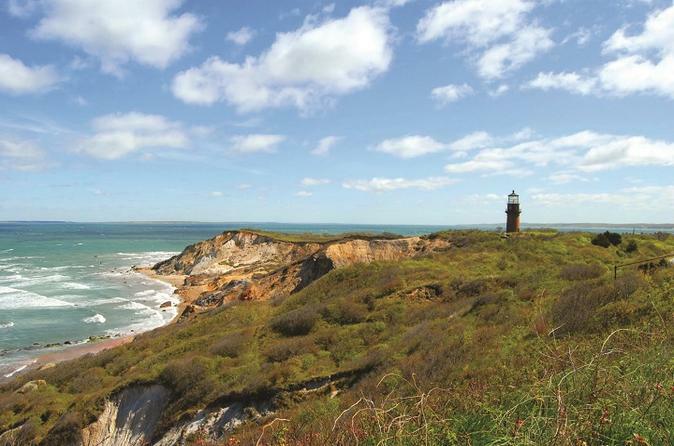 Enjoy Martha’s Vineyard, one of the top summer vacation spots in the US, on this full-day trip from Boston. Get a unique view of this famous and historic New England island community by fast ferry. See white-picket fences and old fishermen's homes sitting along the pristine coastline dotted with dramatic bluffs. Visit the lighthouse on the sandy beach, the famous Gingerbread Cottages, and meet the friendly Alpacas living on the island. Round-trip transportation included. This full-day trip departs from Boston at 7am, heading to Falmouth, MA for a ferry ride to Martha’s Vineyard. (Please note: ferry admission is not included in this tour price). After enjoying a delightful, 45-minute ferry ride, arrive at Oak Bluff for a stroll through the famous Gingerbread Cottages. Take time to explore the local shops and enjoy lunch. Afterward, walk through the beautiful, historic village where former whaling captains’ houses sit. Visit a lighthouse in Edgartown (admission not included). Thereafter, visit an Alpaca Farm (admission not included) to meet the cute alpacas up close. While on the island, take advantage of the convenient public hop-on, hop-off transit system or travel by foot. The tour will conclude with a return ferry ride and transportation back to Boston that evening.